I work with two talented pastors who often come to me with their exegesis when they are preparing to preach. Without fail, they always point to something—a connection, a word, an observation—that I had never seen before. These two pastors happen to be women, and their keen insights sometimes make me wonder if my maleness shields me from a complete view of Scripture. I cannot read the text as a woman, so their reading and proclamation draw me nearer to the full picture the Bible is painting. They invite me to a fuller Christian life because they bring the text alive in ways that my perspective cannot do on its own. This is an example of why we all need more than just our individual readings of Scripture. No matter how educated, experienced, or creative I become, I cannot master the text as the final expert. No matter how plain a text may seem, I have put on cultural, gender, economic, and sociological lenses to read this “plain” text. My perspective may not be bad or wrong, but it is only one of many. I have found, throughout my preaching life, that reading commentaries is a way to confess my biases and acknowledge my lenses. For example, I do not always understand the ancient Jewish customs that provide setting to the narratives of the Old Testament or the Gospels. I also cannot read the text as a woman or a person of color. I am often so entrenched in my own theological persuasions that I can easily miss other valid interpretations and readings. I myself bring dozens of experiences and histories to the text, but commentaries bring other histories, perspectives, and stories. Commentary study invites more full, robust readings of Scripture. Turning to experts who have spent more time in specialized understandings of particular books of the Bible allows a great cloud of witnesses to converse with me as I write a sermon for my particular people. I often engage a given text for my sermon by reading it over and over, documenting what I see, hear, smell, taste, and touch. I ask, what does the text make me feel through my senses? I then read it in context. What is happening in the larger world around the text? The fullness of the letter, narrative, or compiled document informs the meaning of the chosen text. What is the setting? What are the cultural assumptions of the characters? What do these keywords mean, and would an understanding of the original language enhance my comprehension? What is God doing? What are people doing (both right and wrong)? From here, I go to commentaries. I hope to do two major things in commentary work: 1) I want to address my questions. 2) I want to be open to new questions. To do the latter, I need to be open to various voices commenting on the text. People who are of a different gender, personal bias, skin color, social culture, and level of education ought to be among the voices to which I listen. On the other hand, even as I seek to stretch my own understanding, it is also important that I turn to folks within my own tradition. While variety of perspective is important, so is hearing from voices from within my own tribe. I am thankful that NPH—now The Foundry Publishing—is steadily producing the New Beacon Bible Commentary (NBBC) series. 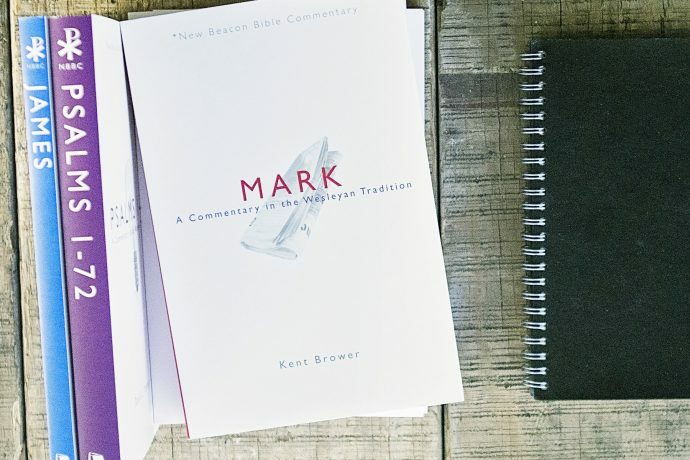 These commentaries have been written by educated, confessional Christians who share my theological background and who help me see how our theological tradition emerges out of the biblical text. Turning to experts who have spent more time in specialized understandings of particular books of the Bible allows a great cloud of witnesses to converse with me as I write a sermon for my particular people. It ensures that I am continuing to read the Bible in Wesleyan ways for a Wesleyan gathering. The commentary should never replace my own voice, but it should support my voice, giving me credible and authoritative legs to stand on as I preach a biblically grounded, theologically sound message in my own context. Commentary works give us the backing of well-researched brothers and sisters in Christ who assist us in understanding and preaching the truth. I encourage you, preacher, to submit to the collective wisdom of commentary writers. Invite them to partner with you in the hard work of wrestling with the biblical text. May their friendship, scholarship, and wisdom draw you nearer to the call of God in the Scriptures, and may your people be enlivened to the Spirit’s work through your collaboration with other voices and scholars. This week we are offering 30% off New Beacon Bible Commentaries. Use code NB30 at checkout! Offer ends tomorrow. Timothy Brooks is the lead pastor of Crossroads Church of the Nazarene, a diverse community of believers in a Ellicott City, MD. He is married to Charryse, with whom he is raising two bright and talented daughters.